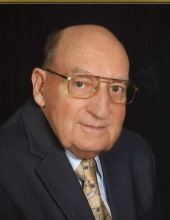 Earl Ward Cline, 87, husband of Agnes Josephine “Jo” Cline of Mt. Solon, passed away Thursday, March 14, 2019 at Bellaire at Stone Port in Harrisonburg. Mr. Cline was born on April 20, 1931 in Middle River (Augusta County), a son of the late John Joseph and Lena R. (Burgess) Cline. Earl was a member of the Pleasant View Evangelical Lutheran Church and a veteran of the United States Army. He was a talented woodworker, enjoyed being outdoors, liked to fish, and attend auctions. In addition to his parents, Mr. Cline was preceded in death by a sister, Margaret (Cline) Cox; and a brother, Bobby N. Cline. grandchildren; and special friend, Gary Michael. A Celebration of life will be conducted 11:00 a.m. Monday, March 18, 2019 at Pleasant View Evangelical Lutheran Church by Pastor Debbie Huffman and Pastor Kenneth Price. Burial will follow in the church cemetery. A meal and time of fellowship will follow in the church social hall. Active pallbearers will be Mark Cline, Patrick Cline, Brandon Cline, Travin Cline, Chase Cline, and Mike Cox. Memorial contributions may be made, in Earl’s memory, to Pleasant View Evangelical Lutheran Church, 2733 Springhill Road, Staunton, Virginia 24401. To send flowers or a remembrance gift to the family of Earl Ward Cline, please visit our Tribute Store. "Email Address" would like to share the life celebration of Earl Ward Cline. Click on the "link" to go to share a favorite memory or leave a condolence message for the family.